Milty's Mag Paris Edition Milton A. Rothman July, 1945 For the Fantasy Amateur Press Assoc. 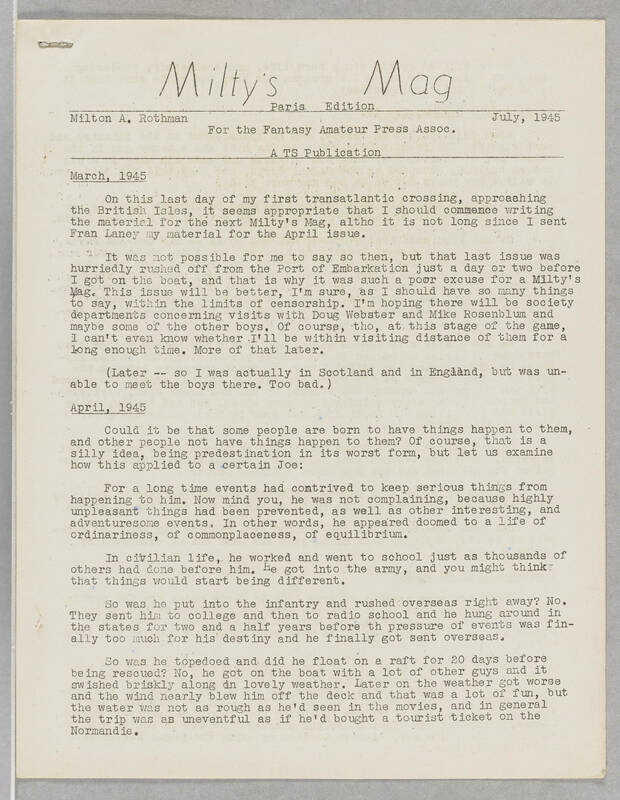 A TS Publication March, 1945 On this last day of my first transatlantic crossing, approaching the British Isles, it seems appropriate that I should commence writing the material for the next Milty's Mag, altho it is not long since I sent Fran Laney my material for the April issue. It was not possible for me to say so then, but that last issue was hurriedly rushed off from the Port of Embarkation just a day or two before I got on the boat, and that is why it was such a poor excuse for a Milty's Mag. This issue will be better, I'm sure, as I should have so many things to say, within the limits of censorship. I'm hoping there will be society departments concerning visits with Doug Webster and Mike Rosenblum and maybe some of the other boys. Of course, tho, at this stage of the game I can't even know whether I'll be within visiting distance of them for a long enough time. More of that later. (Later -- so I was actually in Scotland and in England, but was unable to meet the boys there. Too bad.) April, 1945 Could it be that some people are born to have things happen to them and other people not have things happen to them? Of course, that is a silly idea, being predestination in its worst form, but let us examine how this applied to a certain Joe: For a long time events had contrived to keep serious things from happening to him. Now mind you, he was not complaining, because highly unpleasant things had been prevented, as well as other interesting, and adventuresome events. In other words, he appeared doomed to a life of ordinariness, of commonplaceness, of equilibrium. In civilian life, he worked and went to school just as thousands of others had done before him. He got into the army, and you might think that things would start being different. So was he put into the infantry and rushed overseas right away? No, they sent him to college and then to radio school and he hung around in the states for two and a half years before th pressure of events was finally too much for his destiny and he finally got sent overseas. So was he topedoed and did he float on a raft for 20 days before being rescued? No, he got on the boat with a lot of other guys and it swished briskly along in lovely weather. Later on the weather got worse and the wind nearly blew him off the deck and that was a lot of fun, but the water was not as rough as he'd seen in the movies, and in general the trip was as uneventful as if he'd bought a tourist ticket on the Normandie.